The Quercetin Allergy Complex 's ingredients are integrated to reduce the histaminic response of the body in the presence of various allergens and to reduce inflammatory reactions. Quercetin and bromelain are powerful ingredients designed for the treatment of allergic and inflammatory-based illnesses such as: Sinusitis, Asthma, Eczema, Hay fever and more. Quercetin Allergy Complex also contains phlegm reducing ingredients (NAC) and ingredients that strengthen the immune system (vitamin C and bioflavonoids). Quercetin Allergy Complex may be used seasonally or all year- round without concern for side effects caused by anti-histaminic drugs and anti-inflammatory drugs. Directions: 1 capsule daily, with meals. People taking Coumadin and / or drugs from the corticosteroid family should consult their physician prior to using this product. 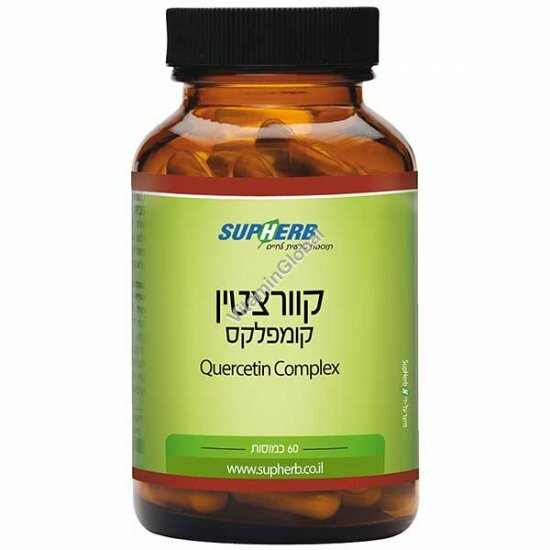 SupHerb's Quercetin Allergy Complex is available in packages of 60 capsules.